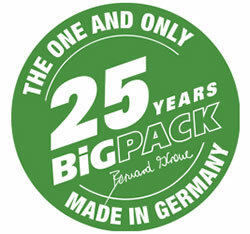 Krone celebrates 25th anniversary of their BiG Pack Large Square Baler. 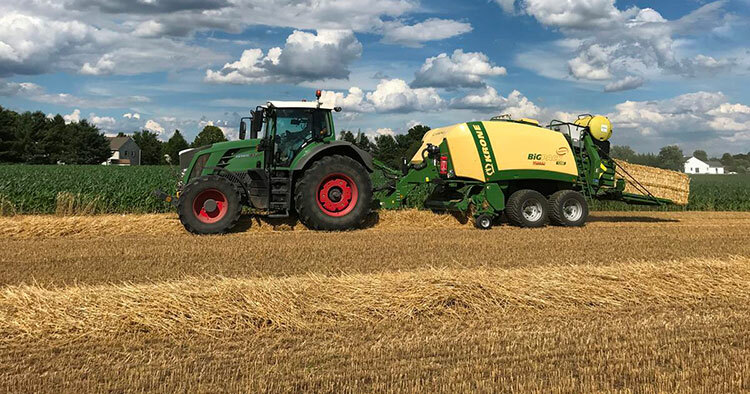 In 1993, Krone came out as the first company in the world to offer a big baler with a tandem axle and a cutting system (three blades). This innovative new design also featured the overload protection clutch on the shearpin-less packer that returned automatically to its previous position. Krone BiG Pack Balers are well-known for producing high-density bales that keep their shape. The reason: In 1999, Krone introduced the exclusive VFS variable filling system. The system boasted four packers and one feeder, with the feeder also serving as a packer until the chamber is filled to capacity. When the feeding chamber is filled, a retainer gives way to the pressure and clears the way for the material to enter the baling chamber, releasing a clutch as it does so. This clutch swings the cam track of the feeder into a different position in which the feeder actually serves as a feeder forwarding the crop into the baling chamber. Once this cycle is completed, the retainer and feeder automatically return to their previous positions.